Those empty eyes – the elderly man’s heartbreak is evident in their absolute blankness, beyond which lies a grief that blankets his entire being. They are eyes that once twinkled, back when he was young. 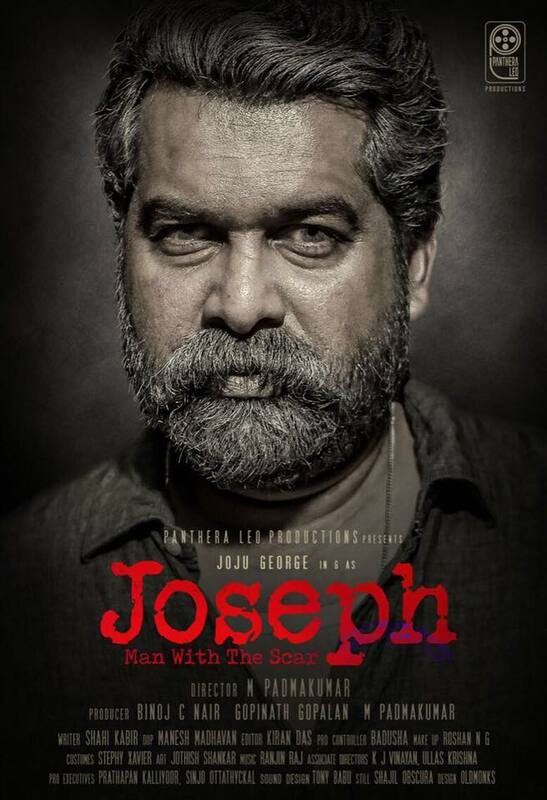 Both avatars of the titular hero of Joseph: Man With The Scar are played by actor Joju George. Joseph is a retired policeman whose Sherlock Holmes-like genius causes the force to still turn to him for assistance in difficult cases. We are introduced to him in a long prologue during which he methodically and quickly solves a double murder. That initial passage is enough to capture the essence of the man: brilliant, world weary, lonely and alone. Through a series of well-placed flashbacks, expertly slipped into the narrative by editor Kiran Das, we later learn that Joseph’s empty nest was once home to a happy wife and daughter. This is a man who has known what it is to have loved and lost, loved again and lost again. A tragic turn of events in the present day compels him to summon up every ounce of the powers of observation and deduction he is known for. (For the record, he is genuinely impressive, unlike the lead cop in that silly, pretentious Mohanlal-starrer Villain last year.) This is a thriller revolving around a police investigation, but it is not a police procedural. M. Padmakumar’s film is high on atmospherics. The director is aided in conjuring up an air of mystery by Manesh Madhavan’s cinematography, which revels as much in tight close-ups of the lead players as in inventive shots of the magnificent Kerala landscape. Madhavan is at his best in large open spaces, where he manages to create the impression that his camera is a living entity not in the frame, stalking Joseph and his associates, watching them from a distance as they go about their business. Occasionally, only occasionally, the camera dwells too long on the protagonist’s sorrowful, ageing face, making it seem like Joju George is overdoing his effort to be enigmatic, and thus reminding us that a great screen performance is not just the result of a gifted actor’s work but the combined effort of a talented artiste, a decisive director, a cameraperson who knows exactly when to turn away, and an editor who knows precisely how many seconds to retain and how many to scissor out, which shots to include and which to discard. George is particularly poorly served in that scene in which Joseph is watching his wife dress up, and appears marginally leery rather than admiring. Had the actor not given any better takes? These moments, fleeting though they are, end up slightly detracting from what is otherwise an astonishingly immersive performance, made all the more striking by the glaring difference between the playful young Joseph and his older, care-worn version, in addition to the stark change from George’s filmography so far ruled by supporting and comic parts (most recently, Udaharanam Sujatha, Poomaram and Njan Marykkutty). Though George dominates the film, the flawless supporting cast gives it its finesse. Especially interesting is the chemistry between the leading man and Peter played by Dileesh Pothan, although theirs is an awkward relationship. One of the best conceptualised scenes in Joseph features them at a funeral where Peter is considerate towards Joseph though he need not have bothered. Peter gets only a fraction of the screen time given to Joseph, but that time has been well used by writer Shahi Kabir. The same justice is not done to the women though. Athmiya, Madhuri Braganza and Malavika Menon have spark, and the characters they play – Stella, Anna and Diana – have potential, but they merely provide the motivations for Joseph’s actions, not one of the three is a fully expanded character in her own right. Still, the little insights that the screenplay provides into life in this Malayali community, the focus on the psychological impact of brutal crimes on police investigators, the central character’s investigative skills, Joju George’s acting and impeccable, transformative ageing makeup, the sweetness of the understanding between two individuals in love with the same person, and the unrelenting sense of suspense that lasts till the denouement make Joseph: Man With The Scar thoroughly worthwhile. It could of course have done without the number of songs packed into the narrative that slacken the pace for no apparent purpose, the melodramatically mournful tone of some of the singing, the slow motion and other shots that linger longer than necessary. For instance, at a funeral, when a character scans the gathering to find Joseph, did his head have to gradually emerge from behind a shoulder hiding him? Most crucially, the final big reveal relies too much on the far-fetched, over-stretched coincidence of one man being personally affected twice by the same crime, but the lead up to the climax is captivating enough to make this film a rewarding experience.